Stop the presses. Osvaldo Quintero sent in a third photo of that warbler from 2008. This one looks perfectly fine for a male Black-throated Green Warbler, a pretty common winter resident to our western highlands: the eye line and ear coverts are more olive than black, and if you squint you can almost see that the back and crown are also olive. 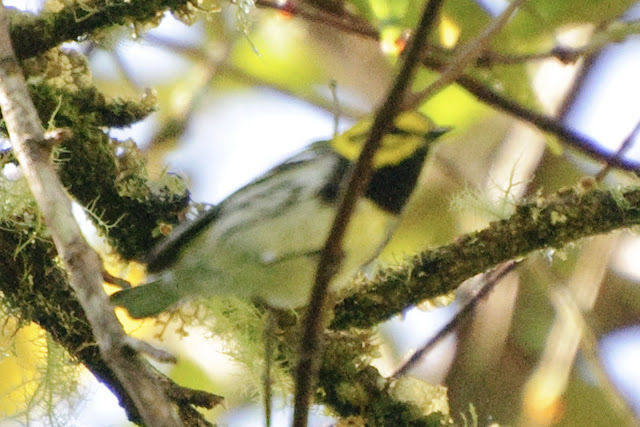 Or maybe it's a hybrid with some Townsend's Warbler in it, which would explain the contrasty facial pattern.